Malted/sprouted grain can be used in the production of value-added bakery products with a superior nutritional profile.2 To date, there is no standard of identity for sprouting in the U.S. Grain sprouting is an ancient phenomenon which may have developed accidentally when harvested grains were left in the field while waiting for threshing. Sprouted grain bread was developed in the 2nd century by a Jewish monastic group known as the Essenes. 1. Steeping: Grains are submerged in hot water in a vessel equipped with mechanical agitation to hydrate the grains and allow them to swell. Residence time varies from 24 to 28 hours where enzymes required for the hydrolysis of starches, proteins and other biological macromolecules are synthesized. Subsequently, high molecular weight polymers are degraded into smaller compounds such as amino acids, dextrins, and monosaccharides, which can be further mobilized to the embryo to serve as nutrients, essential for growth of the new plant. During this process the grain becomes more friable with increased levels of available organic and inorganic nutrients. 2. Germination: Hydrated grains are transferred to a second vessel where cold and humid air flows through as the embryo continues its growth triggered by steeping (water imbibition). The grains are rotated periodically to prevent the rootlets from entangling into an unmanageable mass. Germination takes from 24 to 28 hours. Flow rate, air temperature and humidity as well as grains’ moisture content and acrospire growth, are monitored. 3. Kilning: Germinated grains are transferred to a vessel where warm and dry air flows through to remove excess moisture and arrest enzymatic activity via heating and reduction of free water. Kilning time ranges from 24 to 28 hours. 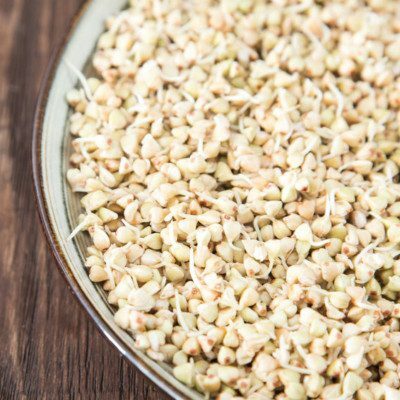 Sprouting can be applied to any cereal, legume or pseudocereal including wheat, rye, sorghum, corn, triticale, oats, beans, lentils, amaranth, quinoa, etc. Quality of a sprouted grain flour can be assessed with the Falling Number test (typically 300-350 seconds for adequate bread production). The challenge in sprouting wheat is controlling the degree of enzymatic activity (beta and alpha amylases) to obtain good baking performances. Cold extrusion or mechanical pressing of unkilned ‘swollen’ sprouted kernels produces flourless dough-like paste. The latter is immediately used to prevent accumulation of enzymatic activity that may negatively affect dough rheology and baking performance. The formulated dough can be then mixed, fermented and baked. Although there is no FDA requirements or definition for grain sprouting, the agency has provided guidelines to reduce the risk of contamination during production, holding and packing of sprouted grains. The AACCI’s Board of Directors (2008) decreed that, “Malted or sprouted grains containing all of the original bran, germ, and endosperm shall be considered whole grains as long as sprout growth does not exceed kernel length and nutrient values have not diminished. These grains should be labeled as malted or sprouted whole grain.” This definition was endorsed by the USDA. Science Direct (Elsevier B.V.). Related Malting Topics. https://www.sciencedirect.com/topics/food-science/malting. Accessed 1 August 2018. MacLeod, L., and Evans, E. “Barley: Malting” Encyclopedia of Food Grains, 2nd edition, volume 3, Elsevier Ltd., 2016 , pp. 423–433. Bewley, J.D. et al. “Germination” Seeds: Physiology of Development, Germination and Dormancy, 3rd edition, Springer Science+Business Media LLC, 2013, pp. 133–433. Boulton, C. “M.” Encyclopedia of Brewing, John Wiley & Sons, Ltd, 2013, p. 388. Richter, K., K. Christiansen, and G. Guo. “Wheat Sprouting Enhances Bread Baking Performance.” Cereal Foods World, Volume 59–5 (2014), pp. 231–33. Enter your information below to receive your free download: Sprouting: Everything you need to grow from Bay State Milling. BAKERpedia & Bay State Milling will use this information to be in touch with you and to provide updates and marketing. Required fields are marked with a red asterisk (*).